Catnapper Vintage 4843 Top Grain Leather Power "Pow'r Lift" Electric Full Lay-Out Chaise Chair Recliner - Tobacco. The Vintage by Catnapper® is a beautiful American chair with classic traditional styling. Catnapper®, manufactured by Jackson Furniture, believes that "sitting is believing". The Vintage by Catnapper® is a beautiful American chair. Jackson Furniture's 80 years of American innovation and attention to detail has created the most comfortable chair imaginable. 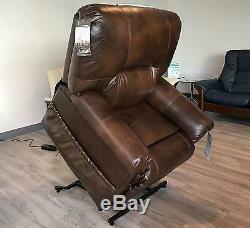 The Catnapper® Lift Recliner with the time-tested lift mechanism of "Pow'r Lift" provides independence for those that struggle to get out of the average recliner. 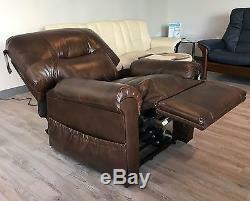 Use your Catnapper Lift Chair to sleep, sit and stand. 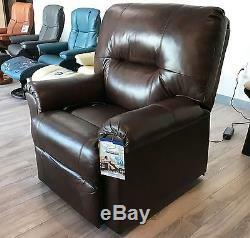 Full Lay-Out recliner with two side pockets for storage are all beautifully styled on a sturdy frame for a quiet, safe experience. 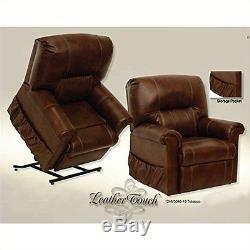 Even if the power goes out you can rest-assured that your Catnapper Recliner will continue to provide you safety. 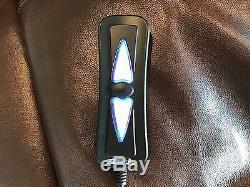 The 9-volt battery pack powers the motor until the power comes back on. Enjoy the independence you deserve with the Vintage by Catnapper®. 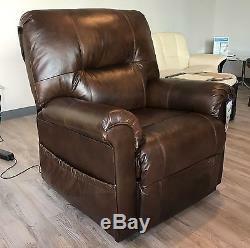 The Catnapper Vintage recliner lift chair by Catnapper will bring comfort and style to your home, featuring, Comfortable Chaise Pad Seat, Top Grain Leather, easy to use remote control. Emergency Battery backup system allows the user to still use the chair in the case of a power failure. 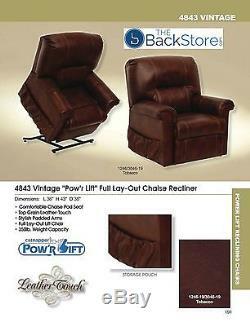 "Pow'r Lift" Full Lay-Out Lift Chair Recliner 350 lb Weight Capacity. Islands and other remote addresses will be extra. 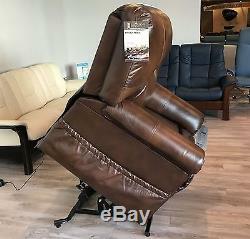 Approximate Overall Chair Dimensions: 36"(Width) 43"(Height) 38"(Deep) Seat dimension: 19"(Height) 22"(Depth) Depth fully reclined: 69"(D) Arm height: 25''(Height) Seat width between arms: 21"(Width) Distance from Wall: 15-17" Weight Capacity: 350LBS Chair Weight: 129 lbs. VISIT OUR SAN DIEGO SHOWROOM! We accept most major credit cards in our showroom. 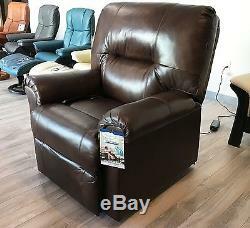 All warranties are to the original purchaser of the chair and they are not for rental or commercial use. 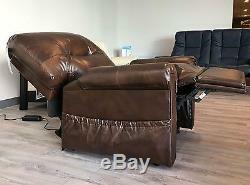 The item "Catnapper Vintage Leather Chaise Power Lift Chair Full Lay-Out Recliner" is in sale since Tuesday, September 12, 2017.